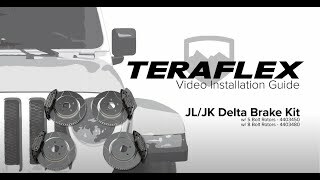 The TeraFlex JL/JLU--JK/JKU: Delta Brake Kit is the ultimate upgrade for JL/JLU and JK/JKU Wrangler models with oversized and heavier wheels/tire combos requiring increased braking performance. A must for 33-42” tires or heavy-laden overland rigs. Includes all the components required to upgrade both front and rear axles. Modulus measures a material’s resistance to elastic (recoverable) deformation under load. A stiff material has a high modulus, which means it only changes shape slightly under high elastic loads before returning to its normal shape. The Delta Brake Calipers features a high-modulus bridge. • Requires a minimum wheel diameter of 17”. • On JK/JKU models, we recommend upgrading the stock master cylinder and brake booster to the Mopar Master Cylinder & Brake Booster Kit (# P5160050). Contact your Mopar dealer for availability. • JL/JLU_JK/JKU: Delta Brake Kit - Front & Rear - 8x6.5” Bolt Pattern (# 4403480) also available.